I'm not quite sure what the problem is. I didn't say there was one, I was explaining to @lifegrIf there is one, it's that both heat exchange and liquid flow occurs in synchronized ticks. And ultimately 999.5 grams of water will exchange heat with 5kg of water. I didn't say there was one, I was explaining to @Lifegrow why there was only a small amount of water in that tile. But if there is a problem, it's that both heat exchange and liquid flow occur in synchronized ticks. Ultimately 999.5 grams of water will exchange heat with 5kg of water. It's not like in the real world where you can't measure the current by looking at the depth. Current... doesn't exist. I don't think there's much that can be done about this, and there doesn't seem to be a need to, either. I disagree. Behind the layer on top, the game runs at least 10 frames per second. 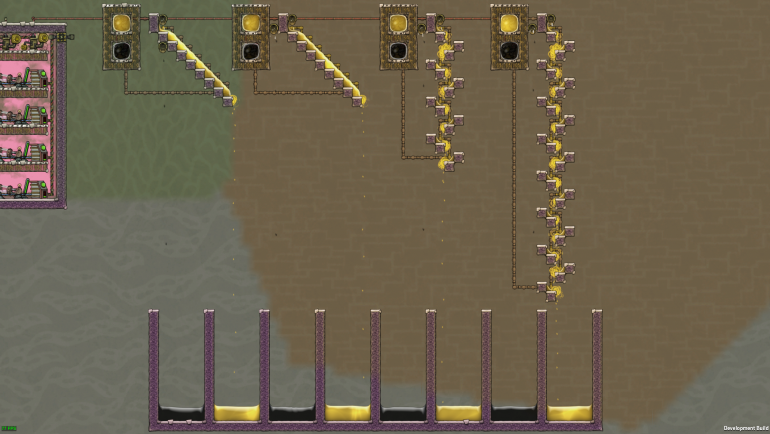 You can see this in automation where we have 0.1s buffers and filters for example. That means heat transfer is calculated at least 10 times per second as well. So with every tick the water in the pipe is compared against 500g of water that is remained from the last tick and 500g of new water, totalling 1kg of water but done 10 times per second. 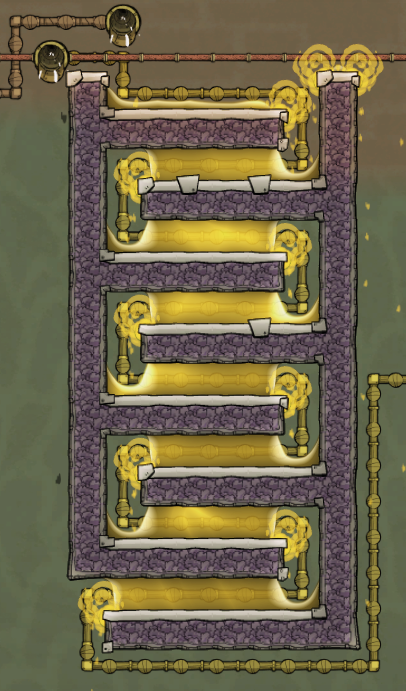 Which in the end looks like there's 1kg of water in the tile while there being 5kg/s flow through the tile. This is related to the weirdness of pipes with 10% or less flow not taking state change damage. Here's an illustration made from using the Sim Step feature in debug. It show the first 5 frames of the ten frames the pipe animation is made of. It is very clear that the heat transfer is calculated at least every frame. Seems like Sim Step (alt-) is what is commonly referred to as tick rate and is 5 per second (5 steps for a packet to advance one pipe segment). Game Step (alt=) seems to be your FPS. On a save getting 80 FPS, I have 16 Game Steps to Sim Step. On a save getting 35 FPS, I have 7 Game Steps to Sim Step. The interesting bit is that it seems that somethings only happen on Sim Steps (or the equivalent number of Game Steps), while other things only happen on Game Steps. Liquid doesn't flow properly if I only advance by Sim Steps for example. I suppose it could be this discrepancy that causes weirdness to arise. Like the terrible heat transfer performance of elbows as @Lifegrowcalls them. See this test for demonstration. Leftmost is 8 radiant pipes with 7 insulated elbows. Next is 15 radiant pipes including elbows, performance is better but not by much. Compare to a drop configuration with the equivalent number of radiant pipes. The 8 radiant drop is a bit better than the 8 radiant stair. The 15 radiant drop is much better than the 15 radiant stair however. Something wonky is afoot. Also note that the stair configuration is deleting heat. Doing the SHC math based off the output crude temperatures, the petroleum temperatures for the drop configuration are correct. The petroleum temperatures for the stair configuration are too low. Borg Cube 2.0? The 8 radiant drop is a bit better than the 8 radiant stair. The 15 radiant drop is much better than the 15 radiant stair however. Something wonky is afoot. Isn't that due to the difference in flow direction on heat exchange I already proved previously? You can't directly compared an open flow heat exchanger that alternates direction to one that doesn't. And, let me point out that by using left to right flow you are using the flow direction I proved would give the largest difference in heat exchange, so you're setting yourself up for drawing conclusions based on something we know to be something wrong with. This is identical to the 15-radiant drop, both output 315-316 degree crude. Saturnus in your tests you've found flatter designs to be better, any chance it's because the "elbows" are counterproductive? I think my test and the numbers speak for themselves. The shorter the steps, ie. the more "elbows" it has, the higher the overall efficiency is. It's just that the efficiency per used pipe section falls because each elbow requires one additional section of pipe. To me the most surprising result is that the longer the steps are the more efficient it is when the overall area used and material cost is considered. Isn't that due to the difference in flow direction on heat exchange I already proved previously? The bias you are seeing is a bug in the temperature calculation in one direction but not the other. The drop configuration doesn't suffer from this bug and was used as a control. A drop going left, right, or zigzag is the same. A stair going right is bugged and presumably that is the reason for the difference between leftwards and rightwards stairs. The SHC calculations add up for a leftward stair and drops of all directions but not for a rightward stair. The bias you are seeing is a bug in the temperature calculation in one direction but not the other. The drop configuration doesn't suffer from this bug and was used as a control. A drop configuration going left, right, or zigzag is the same. 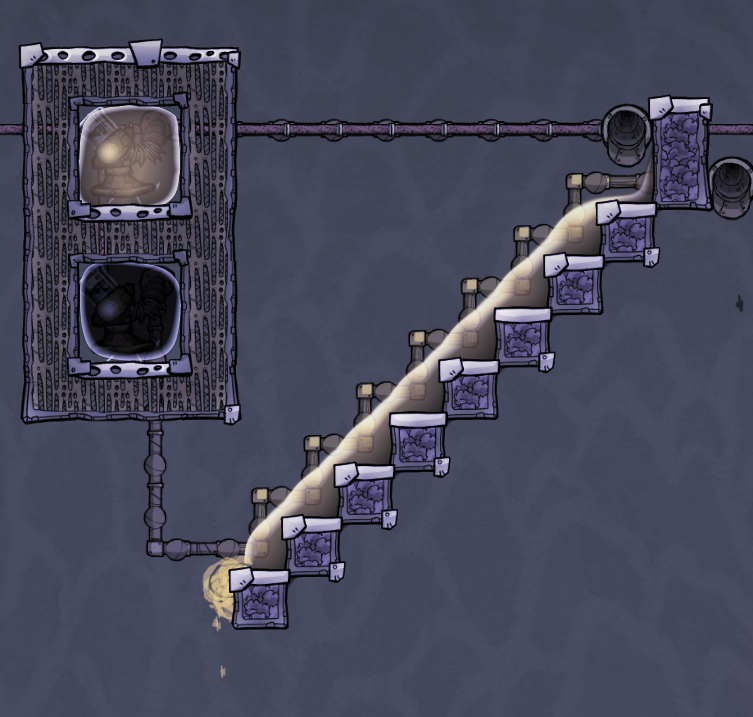 A stair going right isn't different in efficiency than one going left, a stair going right is bugged. The SHC calculations add up for a leftward stair and drops of all directions but not for a rightward stair. So why are you even using a stair going right that you know is not handling heat transfer correctly, and compare it against something you claim, but have not demonstrated, is handling heat transfer correctly? It invalidates your entire argument. The SHC calculations for the drop add up, the calculations for the stair do not. Obviously there is a bug with the stair. 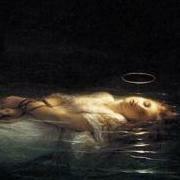 The point of the post was to demonstrate that and muse on a possible reason. I'm not sure why you have a problem with that? This is a forum, not a court hearing. a meeting or medium where ideas and views on a particular issue can be exchanged. Might be handy to stop being quite so guarded and thinking that every conflicting notion is an attack on your own input. The reason I mentioned the "elbows" (I can't think of a better term for them) was that it struck me as odd that you're having a discussion about efficiency, conflicting findings and nonsensical results, without considering something that to me was a vast difference between builds. For a thread that seemed to have less answers than questions, I put it forward as something to consider - just as @wachunga has offered some further insight too. Stop being such snowflakes and be receptive to each other and we'd figure out a heck of a lot more stuff. So conclusion time. It's pretty obvious that the optimum step length is somewhere between 8 wide and 24 wide steps. Did you ever determine the perfect length to use in the end? Right now I'm planning 15 tiles. 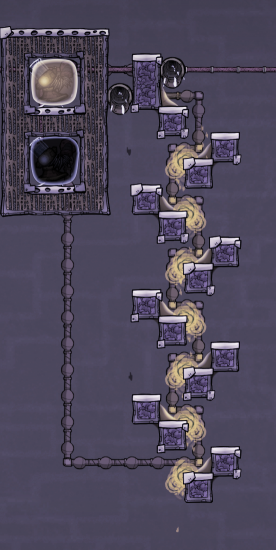 My last petroleum boiler was 4 stairs of 50 tiles so if I can decrease the initially investment cost as much as possible for my next play through that would be great. Did you ever determine the perfect length to use in the end? There's no perfect length. A 45-degree slope appears best if you're OK with just going left, but it's not as efficient with materials as a more gentle one. If you also consider the space used, alternating left-right flow might be best. And I guess that's what you're asking about anyway, as a 4x50 ladder that just goes in one direction is.... not going to fit on the map. "M" here is about 90% effective with gold pipes. You can add more height for even better efficiency. I'm afraid I haven't had time to test it yet. I did however test the "elbows", and you definitely should leave those in though. It's only a small increase in efficiency at about 1.5% but it's undeniably there. No way I'm removing anything that helps even a little, I want to stretch the life of my magma as long as possible that stuff is a nightmare to work with. Trying to build a design that only goes left in survival would be awkward without having it intersect with something. My last design took in crude at about 80c and spit out Petroleum at 106c according to my notes. I'm just wondering if I make it taller and thinner with more steps what kind of height I'm going to have to aim for to match the efficiency. I really only want to work with magma once before I switch to space metal, a mistake with magma is usually catastrophic. 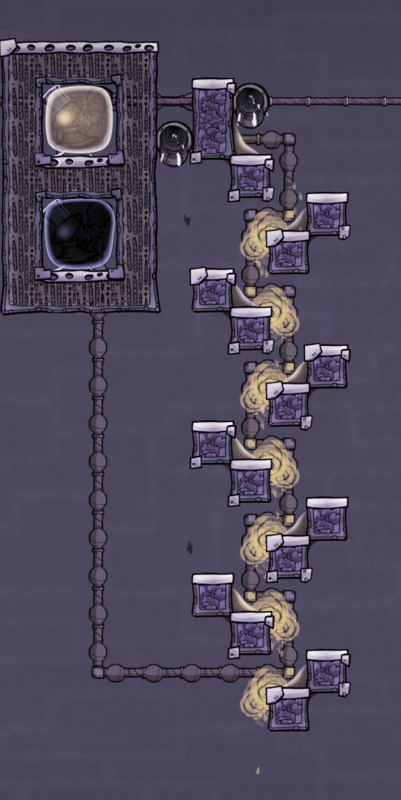 This thread is about the most efficient heat exchange, I want to know how to apply that knowledge to the mid game design (pre space metal) of a magma powered petroleum boiler viable in survival. Goals are boil it, get it out cool enough to pump and most importantly have it sip magma so slowly that you have at least 200 hundred cycles of maintenance free petroleum production at 10Kg/s. Also if you use less than the 10 tons of gold I had to use last time that's a bonus. 106 degrees is really nice. This does 104 degrees with 80 degree crude, and uses 138 gold pipe segments, even though the ones I circled, and their equivalents going down, are in vacuum, so they can be built out of whatever. (It's the 90-degree pipe above the drop, and the pipe vertical in the drop.) Ignoring those it's less than 100 pipe segments or about 5 tons of metal. TBH if you were OK with 115 degrees or so, you could lose half of this structure. I could not settle for 115, each degree of extra heat on the output just means you are burning though your magma faster. The closer the two get to parity the longer the magma will last. 9 stories, that is one tall sucker. Not impossible though if you stick it at the edge of the map, but to make it possible for a dupe to service it would need to add an extra tile high each step so 13 to 14 stories still doable. I thought it was proven that 12 tile steps were the most efficient tested step size so far? I'm not at home but I'll do a little testing myself when I get back. The more vertical you are, the more efficient it gets. You could certainly make this wider, and it'd get better, but if you wanted to get the most out your materials you'd make it taller instead. Surely the object of the heat exchanger would be to get the crude oil as close as possible to 400C in order to reduce the needed heating. I can't see how it matters too much what the output petroleum temperature is as long as it's under a manageable 125C. It only has to go left while exchanging heat. Did some testing today and just want to summarize what is listed in the thread with regards to a petroleum counter flow heat exchange. The best way to exchange heat is to use a free flowing liquid stairs consisting of 1 tile wide steps. But ONLY if the steps are going left. @wachunga found this out. I tested one going right like they demonstrated and it definitely destroys heat. (Crude oil input at 80c outputs at 325c, petroleum input at 403c output at 83c so massive heat loss) However the goal is to have the crude oil heated as close to 403c as possible by the time it gets to the top of the stairs. Using a 45 degree stairs that only goes left would be large and awkward for survival (Getting to opinion at this point) so an alternative is perhaps to combine say a compact 4 story 12 wide stair for the bulk of the heat exchange with a left direction 45 degree stair at the top for the final heat exchange to get the crude oil hopefully to above 391c. The reason I say above 391c is my current design which is ludicrously expensive (10 tons of gold piping) gets it to that temp but that was designed before all of the testing in this thread. Save file -> https://drive.google.com/file/d/1rkc-2868Gsu4fstM0n3NYybcbTiGVvsd/view I really need to do more testing to find a better cost/space design, also need more free time to do it in. I had assumed lower output temp on the petroleum would mean more heat was transferred to the crude oil so effectively they are the same thing. However the right facing stairs deleting heat messes that all up. You are correct I should have referenced crude oil output temperature not petroleum. He only remembered the petroleum temperature from his previous design. I was trying to give him something better based on that metric. Heat deletion bugs aside (which isn't very significant anyway) it doesn't matter if you measure efficiency with crude or petroleum temperature. I don't remember this being quite so bad from @wachunga's save. This is +414 DTU/g for crude and -563 DTU/g for petroleum. I'm as shocked as you are. I'm not at home so I don't have the save on hand, it's fairly simple to replicate. 24 steps going right, full radiant piping including elbows. Crude oil at 80c, petroleum at 403c. Edit : I had the whole thing in a vacuum. 24 steps going right, full radiant piping including elbows. Crude oil at 80c, petroleum at 403c. The right-going stair on the other hand is 36% loss. It's not just about liquid flowing left, because there's a lot of that happening in the 2nd and 3rd example above, possibly more than in your stairs. It's not about straight-then-down elbows, because those are in vacuum above. It's not about down-then-straight elbows because the 1st example is very fair and those the only type of pipe it exchanges heat with (everything else is in vacuum).